Ever since the big nor’easter we had earlier this month, there has been a new tourist attraction of sorts along the coastal road between Revere and Winthrop. 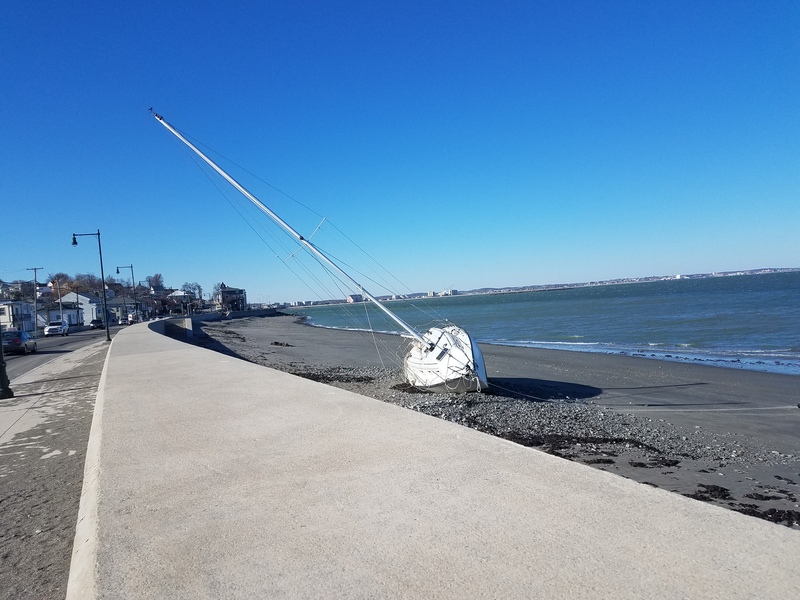 A sailboat washed ashore, dragging its mooring line with it. The storm washed it almost all the way up onto the sea wall. I can’t imagine that the boat was not damaged in the process. What a shame. I wonder when someone will finally come claim it. Anyway, it seems as if at any given moment, someone has stopped to look at the erstwhile shipwreck and take pictures of it. The first day after the storm, there was a whole row of cars. And every single time I have driven along that coastal road, no matter what time of day, there was someone looking at the boat. Seriously, every single time, including today, when I finally stopped and got a picture or two myself. I hope it is not too badly damaged. Previous Previous post: Two craft shows coming up – now with extra #vintage!